Start your sail at Maya Cove right on the Sir Francis Drake Channel in the heart of sailing territory. This is the spot for sailors! Minutes from the Beef Island airport, the salt air already deep in that place in the psyche that has always said, "it's time to go back to the sea." A tropical destination, an active harbour, a place for sailors! Best of all, Sunsail is known for the quality of its service. You have a problem, they take care of it! Remember, you are on vacation. Have fun! 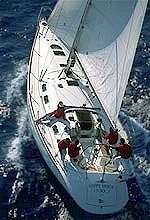 Let B-V-I Travel Online help you plan an incredible sailing itinerary. Email us with your questions at sopers@b-v-i.com. Sunsail is a world class charter company both in the quality and number of boats in their fleet. These yachts have been selected over time to match the requirements of the bareboat charterer. Oceanis 461. Great for 3 couples, this yacht has three equal, ample and well ventilated cabins. An extremely nice cruiser, the 1997 year having been awarded Cruising World's Boat of the Year for best value as a full-size cruiser. Sun Odyssey 52.2. Great for groups up to ten, this magnificent boat has five double cabins (see plan below). A fabulous sailing machine, this yacht has high performance as well as cruising capablilities. Fits three couples or a group. See Specifications of more of the Sunsail fleet. Bareboat Rates are set out below. All rates are per yacht for one week US $. Charters begin on Fri., Sat., Sun. or Wed. at 6PM with a sleepaboard the first evening and finish at 11AM on the final day. *Fuel not include in the price of Trawler. *National Parks Permit NOT included (the cost is approx. $20 per boat). * Payable in cash or travelers checks only to the marina office in BVI upon arrival. Rates are per person per day. $25 per day. The Sunsail CDW provides you with coverage for damage to the yacht except in the case of intoxication or gross negligence. A $250 deposit is taken at the base to cover loss or damage of the yacht inventory, the dinghy, and/or the outboard. The deposit will be returned at the end of the charter at the base. *Skippers/Cooks must have their own cabin. Prices are per day plus gratuity and all crew meals are included. PAYMENT TERMS: 25% deposit of the charter fee confirms the reservation. Final Balance due 60 days before departure. Receipt of your deposit initiates the cancellation policy. 90 days of more prior ot departure: $300 penalty. 89-61 days prior to departure: loss of 25% deposit. less than 60 days prior to departure: no refund. SUNSAIL PROTECTION PROGRAM: 6% of invoice total. Specifically designed to offer charterers protection from the financial losses incurred from cancelling. This new program includes coverage for charter cancellation, charter interruption, trip delay, skipper coverage and hurricanes for only 6% of invoice total. Ask for details. TRANSFERS TO BASE: Sunsail can arrange for a taxi from the airport to the base. Taxi transfer costs are included in the Deluxe Sailing Package. When Sunsail flights to Tortola are purchased, taxi transfer is included, but not in the Bareboat Rates..